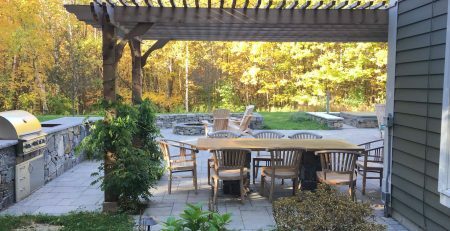 Whether it’s warmer weather with climbing A/C bills or cooler temps are here and you’re stretching out the days you can spend outside, you’re probably looking for a way to extend the life of your patio. 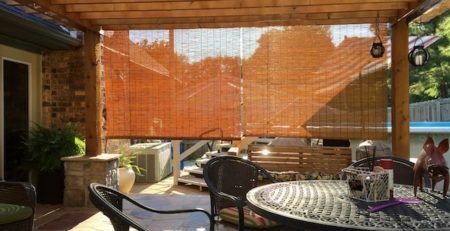 If you live where it’s a sun-drenched yard year-round, backyard shade covers such as trees, plants and outdoor structures might help cool things off. 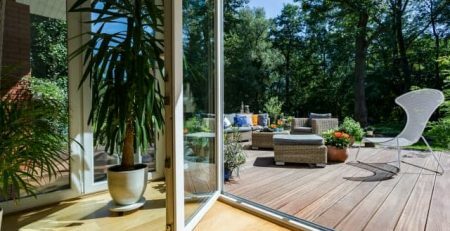 If sun is streaking directly into your windows during the peak of summer, your house can soak up extra heat and challenge your overworked cooling system. Consider time tested backyard shade ideas such as landscaping with larger trees and shrubs, and adding surrounding structures to help keep your home shaded and cooler this summer. 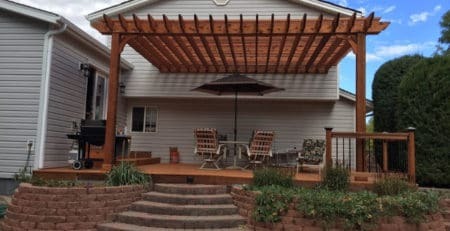 Or create a new backyard shade area with pergola patio cover to use as a mini-retreat away from the heat! One way to add shade to your yard and home is with trees and shrubs. Since most of us are looking for quick-fixes, one of these faster growing shade trees shown here on This Old House could be a quick sunblock solution. They’ll add shade and potentially keep your home cooler. Bushes and shrubs are good for keeping the base of your home (and even the pavement around it) cooler. And if you like the look, clinging vines along an arbor will provide some amount of shade. If you’re looking for shade in the summer, but sun and warmth during the winter, deciduous trees are a good option (depending on your climate). These will lose their leaves in the fall, allowing more sun to hit your home and help keep it warm during the colder months. 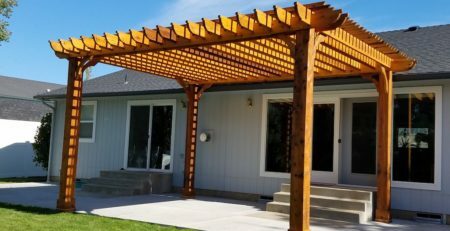 If you’re looking for more instant relief from the sun’s rays, a structure like a retractable canopy, a wood awning such as our Visor pergola kit, or a freestanding pergola on your patio can offer you and your guests a spot of shade as they gather in your backyard. Wildwood Land Design in Tennessee designed this welcoming poolside retreat that’s great for entertaining and relaxing, and creates backyard shade that is highly sought after during these hot summer months! 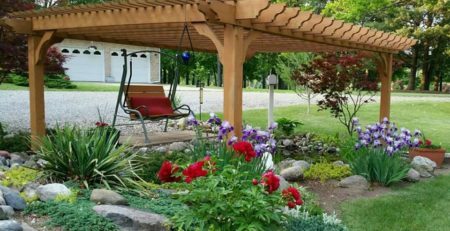 Structures such as awnings or pergolas offer a great way to create a shady retreat that won’t rely on Mother Nature to survive. These structures can be made to order and are built with materials that can easily fit alongside your current decor. Once you figure out your most sunny spot, you can start measuring. 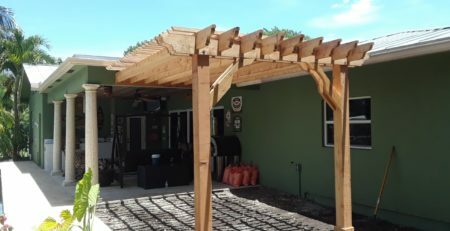 Consider contacting your local contractor to help with the design, planning, and assembling of your dream for backyard shade! Check out our growing pergola installer directory or forward this on to your local landscape contractor. 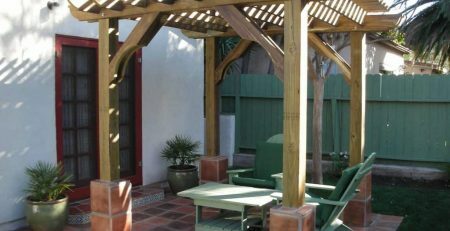 Backyard shade covers can be constructed to create that year-round retreat you’ve been imagining!